Launched in May 2018, Victory II is almost identical to its sister ship Victory I, which debuted in 2016. Both ships were bought by American Queen Steamboat Company in 2019 and have received mini-makeovers before the summer sailing season begins. Seven cabin categories include two 325-square-foot Owner’s Suites with private balconies, and 101 staterooms ranging from 130 to 190 square feet. All shore excursions are included, as are “free-flowing” house wine, beer and spirits. There’s free Wi-Fi in public areas, a pillow menu, afternoon tea and a pre-dinner cocktail hour. Before its revamp, the ship sailed as the Cape Cod Light and more recently, the Sea Discoverer. While it has an international flag and uses international crew, the ship iteself was built in the U.S., at the same shipyard as AQSC's ship American Empress. So the company plans for its friendly, laid-back onboard vibe to conintue. 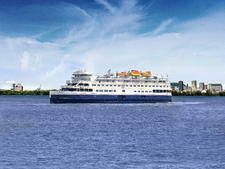 Itineraries will focus on the Great Lakes, with the ship sailing primarily between Toronto and Chicago. Future plans call for the ship to sail the Eastern Seaboard, as well as Mexico's Yucatan Peninsula.